I arrive twenty minutes late to dinner at Juliana’s Pizza in Brooklyn. I find Gabe Cohn ’16 and Kallan Dana ’19 chatting amicably in a vestibule, sheltered from the January cold. I explain that I had gotten lost on the subway, to which they both laugh—they’ve been there before. We enter together into the crowded, homely little restaurant and find a table tucked away in a corner. Not far from us, we see chefs tossing dough and sliding pizzas into an open stove. Every once in a while, we hear the loud clank of metal-on-metal coming from the kitchen. Cohn has chosen this spot as the place to meet us. “I lived a fifteen-minute walk away from here until I was five,” he tells us—practically around the corner on his terms. We order two pizzas to split between the three of us. Kallan and I have known Cohn from the one year we overlapped at Skidmore, when we were first-years and he was in his final year. He is not only a peer of ours, but also our former supervisor and predecessor—the founding Editor-in-Chief of the current iteration of the Skidmore Theater newsletter. 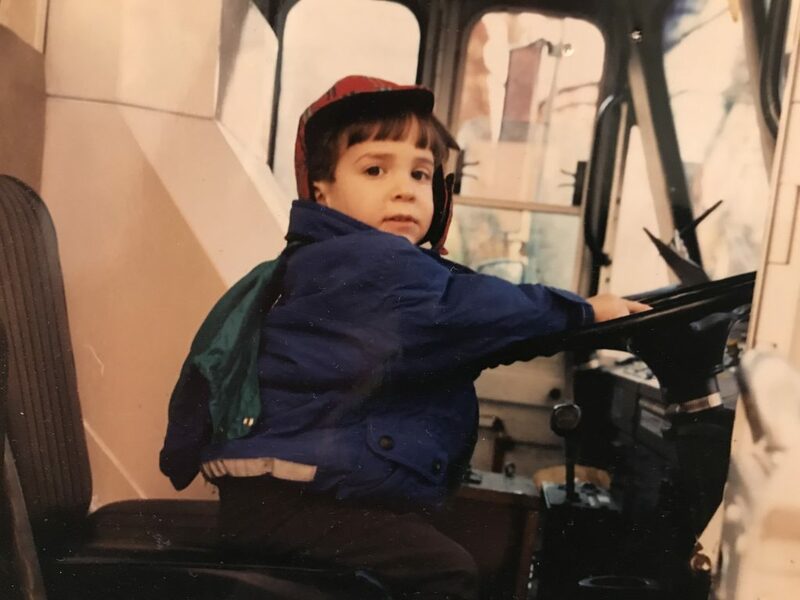 Cohn as a child in the diver’s seat of a garbage truck, Brooklyn. Cohn surveys the restaurant with a smile. “This is a famous spot,” he says. The owner, Patsy Grimaldi, is well known, he explains. “He’s been written about several times.” He runs us through the lore: the restaurant (located at 19 Old Fulton Street) used to be named Patsy’s after its owner, but was sold off in the ’90s and renamed Grimaldi’s by its new ownership. Tensions developed between Patsy and the people who took over his new pizza place and when Grimaldi’s was kicked out of the building, Patsy saw an opportunity, and once again became a tenant of 19 Old Fulton Street, opening a new pizzeria, Juliana’s, named after his mother. Cohn’s parents used to come to Patsy’s all the time, their young child in tow. 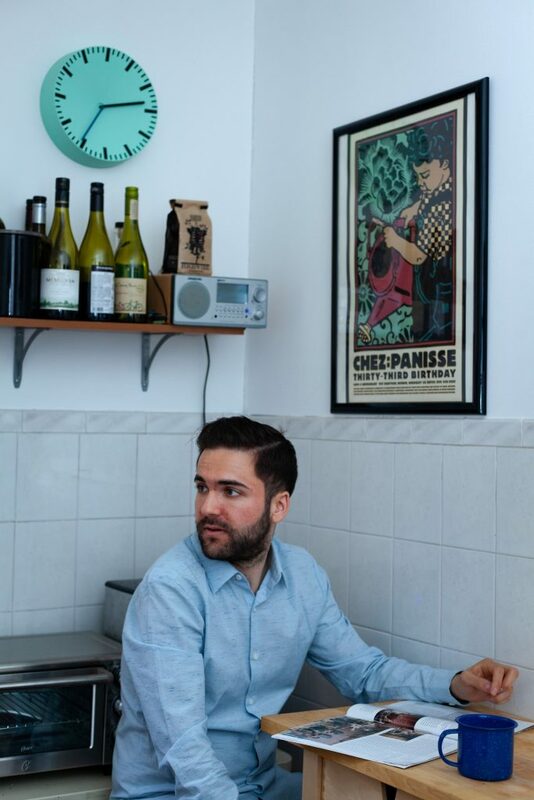 “The thing I should say is that my parents are both also writers,” he tells us later. Though it seems obvious that he is taking after his parents in his career, he jokes that he didn’t think of his situation that way until recently. “What’s nice though, is that I read my parents’ work now, and I genuinely think ‘this is good,’ and see it as something to look up to,” he says. 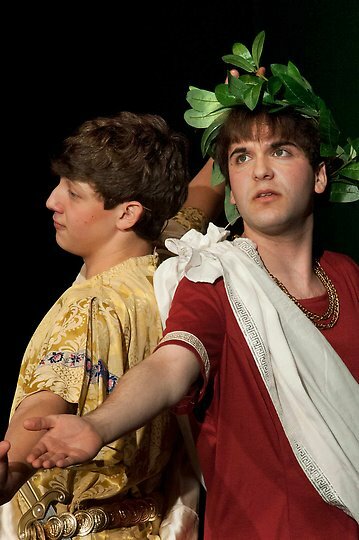 Cohn performs in A Funny Thing Happened on the Way to the Forum as Senex in 2012. 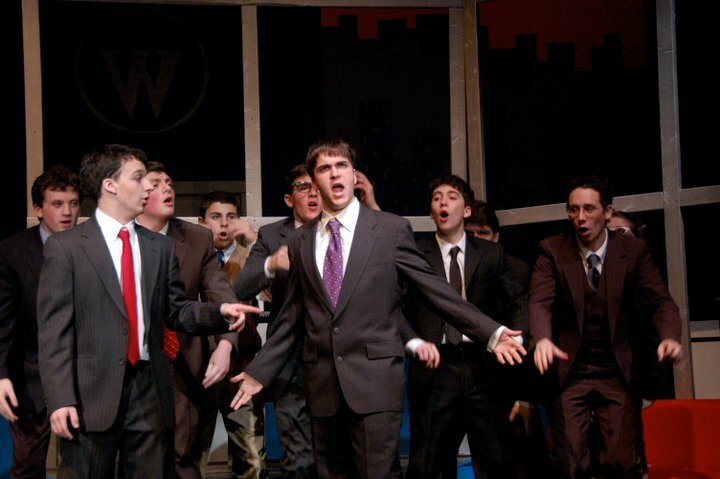 Cohn ultimately decided that Skidmore would be the best fit, and matriculated with a vague idea of majoring in music (“I just wanted to play guitar,” he remembers). In time, he realized that his talents and passions better suited him to the English major, and this, combined with this love of theater, led him to begin writing for the JKB newsletter. The end of his junior year, he applied to become the editor and got the position for the following year. In the time that Cohn was in charge, the structure and purpose of the newsletter were radically transformed. Chief among the changes was switching the newsletter from physical publication to its current existence online. Along with moving the newsletter (now officially retitled the Skidmore Theater Living Newsletter) online, Cohn expanded the confines of what kinds of articles were published. At the time he took over, almost all the Newsletter articles were recaps of each departmental production. Taking over in his senior year, Cohn was eager to do something new. “I grew up reading Rolling Stone and I knew the thing I really wanted to do was write a profile of someone,” he explains. He saw his new position of leadership as an opportunity to create an outlet for this kind of journalism that he wanted experience writing. He realized that, through the Skidmore alumni network, he may be able to practice this form on a certain celebrity. “I wanted to do a profile of Jon Bernthal,” he says. “I grew up reading and loving the celebrity profile, and I thought ‘this is someone I have access to.” Cohn knew that Bernthal had attended Skidmore, and that Kessler knew him personally. He also knew that celebrity profiles are typically the cover story of magazines, and that when he graduated and began writing outside school, he was unlikely to get those same opportunities as a young writer. “I wasn’t just doing it for personal gain, I also thought it would be exciting for other people,” he says. “But at least a healthy amount of it was for personal gain,” he laughs. 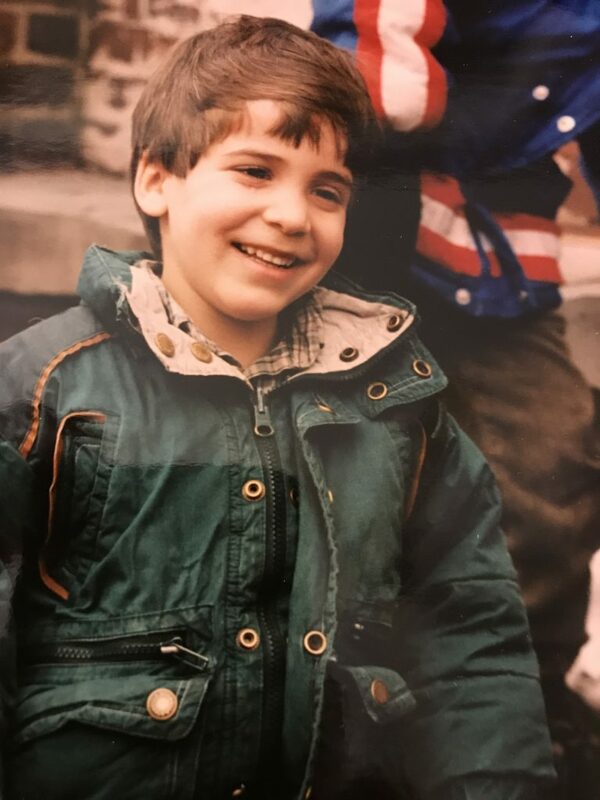 Cohn as a child in Brooklyn, NY. Cohn has continued to be impressed and grateful for the help he’s received from people in positions of authority. In his final semester at Skidmore, he took Kessler’s Theater Management course and met Rebecca Marzalek-Kelly, Skidmore alum and two-time guest director who came to speak to the class about her position of Associate Director of Membership at Theater Communications Group (TCG) in New York City. He learned about an internship position at TCG’s American Theater magazine from her, and ended up taking one for the summer after graduation. The job at American Theater was a jumping-off point for Cohn’s career as a writer in New York, largely due to the doors it opened up for him. He was given the chance to travel with American Theater to its annual conference in D.C., where he met a New York Times editor at a Q+A event the editor was partaking in. He ran into this same editor on a lunch break, where the man asked him if he wanted to grab a cup of coffee. “I think I had to get back by a certain time,” Cohn recalls, “but I just had to say yes.” In their impromptu meeting, the Times editor gave Cohn some writing advice along with his contact information. For the next year, Cohn would (politely, he stresses) email the editor updated resumes as he took on new writing jobs. Cohn at his current home in Park Slope, Brooklyn, NY. Photo by Dorothea Trufelman. Near the end of his year at New York, Cohn was doing freelance fact-checking for the magazine’s wedding issue and preparing to leave the internship, which had been extended far beyond its standard length. Out of pure luck, the Times finally responded to his resume and asked him to interview for a job as a News Assistant. He holds this position today. As a News Assistant, he’s been assigned to work under several different departments within the Times. “It’s been like going to grad school, going to all these different offices,” Cohn reflects, speaking about the all the different positions he has held at American Theater, New York, and now the Times. “Even just reading a lot of great writers and being in the building and seeing what’s going on. I’ve found that really helpful.” Not only has he gotten the chance to work under great writers, but he’s written several of his own features, including a research-based piece on Slender Man, a profile of the $1 million grant-winning filmmaker, Faraday Okoro, and, most recently, an interview with Rami Malek on the day he received his Oscar nomination for best actor. Philip Merrick ’19 and Kallan Dana ’19 are Co-Editors-in-Chief of the Living Newsletter.